Travel rewards. Use this card to earn 2X miles on all purchases, every day, without having to track your spending in particular categories. You can also redeem miles for travel statement credit. 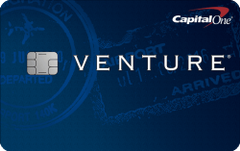 The Capital One Venture Rewards Credit Card is one of our picks for the best credit cards of 2019. Our take: The Capital One® Venture® Rewards card is a flexible rewards card with a high rewards rate and valuable perks for frequent travelers.